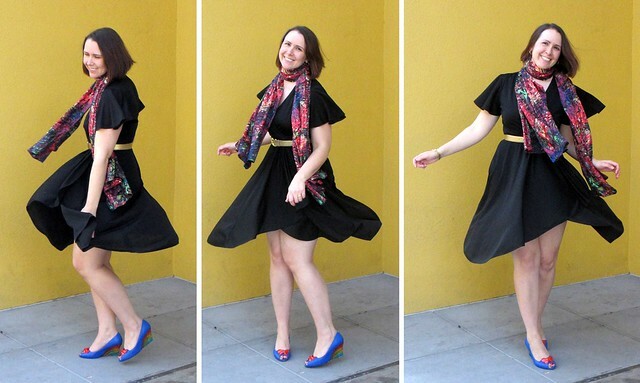 The LBD Gets a Colorful Spin! San Francisco weather is all over the place. This weekend it’s been drizzly and chilly. But not too long ago it was sunny and warm . . . and I took out one of my LBDs for a spin. Photo by Santina of Style by Santina. This is one of my go-to dresses when I want to wear something easy. It’s made of a polyester jersey knit (of the late 70s/early 80s variety), so it never wrinkles. (It happens to be a great traveling dress for that reason — and because it’s super easy to accessorize!) I picked it up several years ago in a Chicago vintage store for about $20 – a steal considering how often I’ve worn it since! 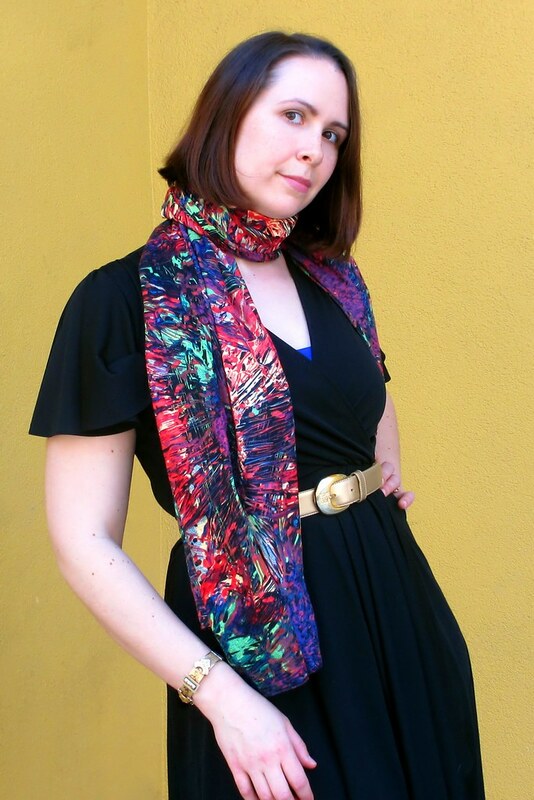 And I ADORE color, so I paired the dress with a fantastic scarf/shawl from ModCloth and a vintage gold Anne Klein belt that I recently scored on Etsy. I also added one of my favorite pieces of jewelry — a Victorian mourning bracelet that used to be my aunt’s. She wore it all the time, and I think of her every time I wear it. The color didn’t stop there. 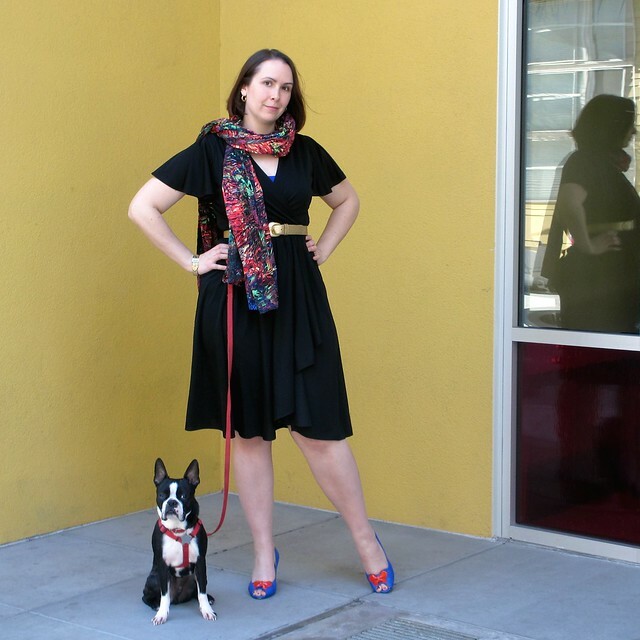 In fact, this outfit was actually built around my shoes: rainbow-hued wedges by Poetic License. Rainbow Road Wedges. Photo by Santina of Style by Santina. When I saw these shoes a year or two ago, I knew I had to have them! They remind me of Rainbow Brite, one of my favorite childhood cartoon characters. 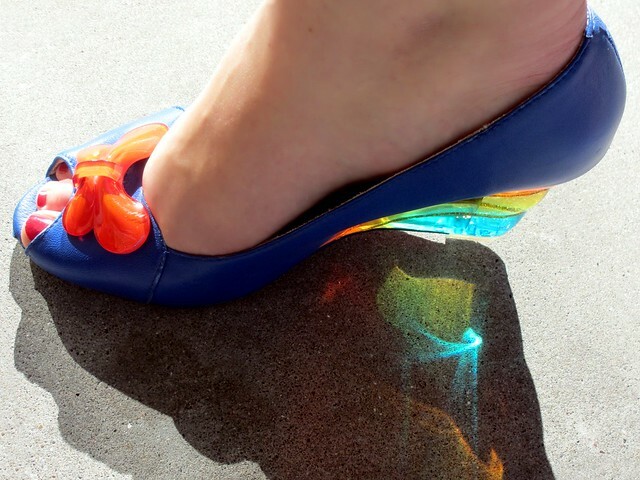 Sunlight shines through the heel, casting a mini rainbow on the ground! So when I wear these shoes, I’m always somewhere over the rainbow. Literally. The whole ensemble. Photo by Santina of Style by Santina. Thanks so much! And yes, Rocky’s a Boston. Would love to see pics of yours! Your link just went to blogspot.com – do you have a blog? oh sorry about that, must have written something wrong in the blogadress. Yes I have two blogs, one for my style/outfits – http://colourmakespeople.blogspot.com and one for my doggie – http://frenchiemakesmyday.blogspot.com. The last one is only in Norwegian but you can still have a look at the pics of course. ;) My dog is called Una. :) Thanks for the interest! I agree, this is such a cute dress and I love the way you styled it! Those heels remind me of a pair of shoes I had in the ’90s, ;-). Thanks for stopping by and taking a moment to say hello! I love this dress, and the accessories you added are perfect. Those shoes, oh my goodness, so adorable! They definitely look like Rainbow Brite shoes! I’m more of a ‘Jem girl’ but I did love Rainbow Brite too! Thank you! I also loved Jem, truly outrageous! In fact, I have a pair of Jem earrings – will feature them in a post some time! 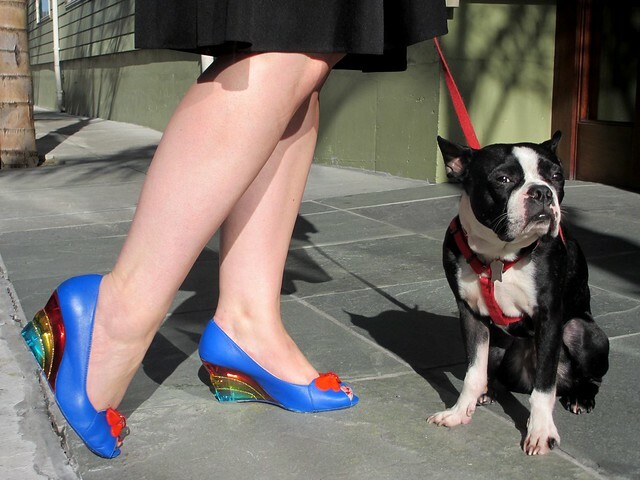 I can’t get over those shoes – so cute!